3D Movies, Star Parties, Lectures, Night Sky Viewing and much more..
Visit Ballarat and come to Ballarat Municipal Observatory Museum and Learn about the Cosmos with our 3D Astrotour theatre, view planets & stars with our modern & historical telescopes. BOOK HERE for a Best Nights for Viewing 2019 discount of 15% applies to these nights for bookings made online. A program of activities will apply to these evenings. Arrival time can be closer to viewing time. More information on bas@cbl.com.au or phone 0429 199 312. Bookings essential for evening program, group bookings any7th March time. Saturdsy 23rd March , closed in the evening. Tuesday and Thursday open from 2.00pm and booking can be taken by 4pm for the evening program beginning at 7.30pm. Saturdays – evening bookings available starting at 7.30pm. The Observatory will be closed unless there is a confirmed booking for the evening program. 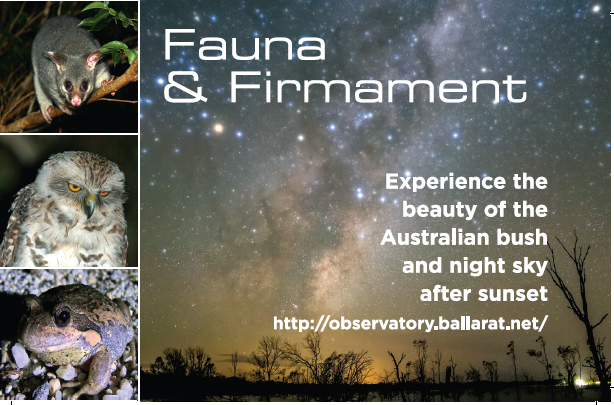 The Ballarat Observatory and Golden Nugget Discovery Tours have come together to give you an unforgettable bush and night time experience. Group bookings for other times call on 0429 199 312. 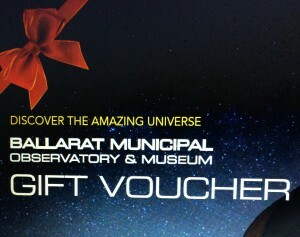 Sunday , Monday and Wednesday the Observatory is closed unless there is a pre – arranged booking or special event is on. For help in planning your visit Frequently Asked Questions. Join BAS and become a Member. Benefits include 20% Discount in our Science Shop and for all events, and 10% discount in the 3rd Rock Cafe – great value! The Observatory will be expanding the opening hours over the four weeks of the Ballarat International Foto Biennale (BIFB) later in 2019. To that end, an invitation is extended to Community Members who would like to help to make the above successful. The program for Volunteers, maybe extended beyond and/or before the BIFB depending on response, bring along your ideas. A position for a Convenor of Volunteers is also available. An initial meeting will be held on Tuesday 26th February at 3.30pm, refreshments included. The Ballarat Municipal Observatory and Museum is delighted to have been awarded the 2017 Greg Binns Award for Outstanding Community Contribution to Heritage. Astrophysicist plans to spend prize money — awarded 50 years after the discovery — on increasing diversity in science. At the Earth Hour event on the 24th March 2018 all participants voted to work towards the City of Ballarat becoming a Dark Sky Community. More……..
How good is your backyard sky? Find out here- Light Pollution-What is It? 5th Lunar Apogee 20:29hr AEDT, Dist. 406,551.5km. 8th Jupiter morning object rising earlier at 02 :06 AEDT, mag. -1.9, dist. 862,657,977km, now moving closer to Earth. East of Antares in Scorpio. 8th Mars sets 23:23hr AEDT, mag 1.0, dist 237,140,308km, in Pisces. Uranus just east of Mars. 8th Venus is a morning object, rising at 03:17hr AEDT, mag. -4.3, Dist. 137,414,353km, in Sagittarius. 8th Saturn is a morning object, rising at 04:03hr AEDT, mag. 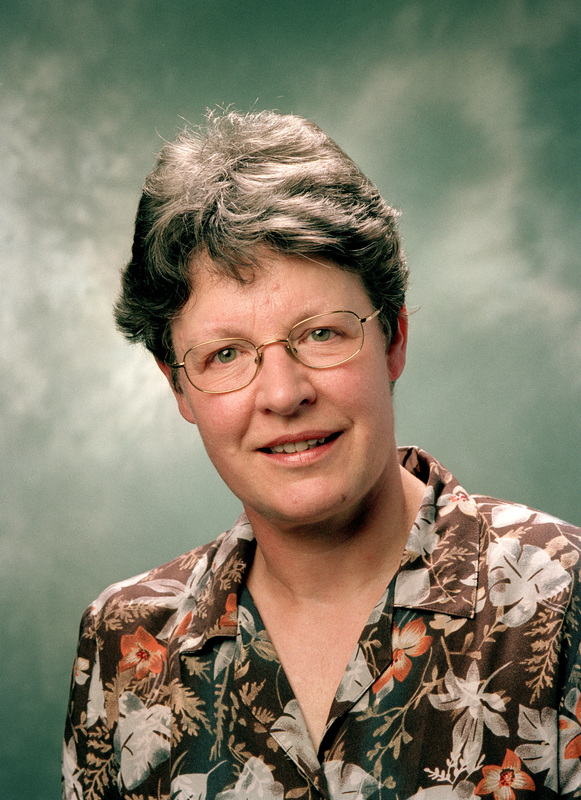 0.6, Dist. 1,626,337,498km, moving towards Earth. 8th Mercury is an Evening object, setting at 21:00hr AEDT , mag. -1.3, :dist. 200,435,771km East of Saturn. 19th Lunar Perigee 20:00hr AEDT, Dist. 356,762.8km, a 'supermoon'.